Baked oats take me a lot longer to eat than a normal bowl of porridge and lovely and filling. I served mine here with a tablespoon of low fat natural yoghurt and a final sprinkle of cinnamon but feel free to top them with whatever you fancy. Pop all the ingredients into a large bowl and combine well. Take a small baking dish (I used an individual lasagne dish), spray with 1kal and add the mixture. Pop in the oven on 200c for 25-30 minutes. Serve with a dollop of low fat yoghurt and a final sprinkle of cinnamon. Would these be free on Weightwatchers No Count? This looks fantastic. Have you ever made it ahead and reheated it? Do you think it would work? Just thinking my daughter would love this but I’d have to get up very early to feed it to her for breakfast! Hi Louise, I haven’t but I think it would still be lovely. I sometimes make them in smaller muffin form and they are lovely cold too! Could this be made the night before and reheated? Did you think this would be possible to do in the microwave instead of oven? I’ve never tried Amanda so I’m not sure. At a guess I would think it would cook as normal porridge would in the microwave so many not? So pleased you enjoyed it Sara, that sounds like a great addition, might give that a try myself! Hi Laura. I’ve made a lot of your recipes and love all of them. 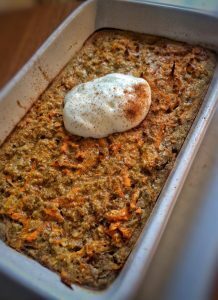 I’ve recently made your baked oats and they’ve become a firm favourite in our house. Many thanks for all your ideas. This is soooooo nice. I was stuffed by the end of it so I’m hoping it’ll see me through to lunchtime without the tummy rumbles. I’m going to try almond and cherry as well. Thank you so much. So glad I found this website! Loads of fab idea. I made this last night for today’s breakfast. I fudged it up as I wanted to make a whole tray rather than the one serving (I should have tried that first instead of getting creative) I wasn’t a fan it was very heavy and tasteless but you could tell there was egg in the mix ( I added two eggs as I was trying to make 6 servings) , although it was better with yogurt. I’m 100% sure this is lovely and a must I eat it cold this morning and it tasted OK but I imagine its divine fresh from the oven. My advice would be to not do what I did and shove everything in the bowl and make it up. If you want more than one serving following the recipe for the one and just keep doing that into muffin tins, that is what I’m going to do later this week.